Like a jet ski buzzing my bow, the summer was a ride that went by like a blur. It was rough at times, but rewarding. Most importantly, I came out unscathed. Before the snow was even off the ground my garage was filled with kayaks. My business, Small Craft Outfitters, was in business for its second year. 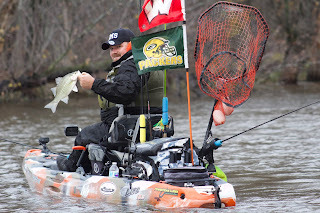 We had exponentially more kayaks and guided kayak fishing trips this year. I feel truly blessed to have had such a good year already! We still aren't out of the red yet, but we will get there. Someday. I love bringing my passion of kayak fishing to others through my writing, forums, social media, selling kayaks, and guiding. Between the business adventures, my family, volunteer EMT work, and day job the summer filled up to the brim. As the season wound down, my wife reminded me to be cautious. She doesn't want to see my passion become a job or a grind. 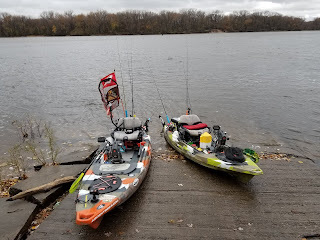 I had only gotten out on the water a couple times all season for pleasure. Even then, it seemed I was piggy-backing some kind of business engagement on those trips. Fate and/or Mother Nature must have concurred because the temperatures quickly dropped here in Northwest Wisconsin. The boat launches and beaches are barren and the warm summer air captured by the water can be seen succumbing to the crisp fall air as a thick fog in the mornings. Fall, my favorite fishing season, brings business to a screeching halt. An opportunity to re-center. Reduce focus on the business and focus on more important aspects of my life. My family, my community, and myself. Fall allows me to slow down, spend more time with my family, open up my weekends to increase my volunteerism with our local Emergency Services, and spend some time on the water with my friends. This is my Happy Place. This year finding my happy place didn't come as easily. Between my busy schedule and the odd weather, this year was a tough bite. There were record temps and record flooding that impacted my favorite fisheries. This made my job as a fishing guide much more challenging and, at times, downright frustrating. Last weekend, I was still stuck in that rut as Chang Lor of Cxfishing and I tried to get on a fall bite. Our favorite fall spot was saturated with duck boats, our backup spot was limited in launch locations due to maintenance on the reservoir's dam. 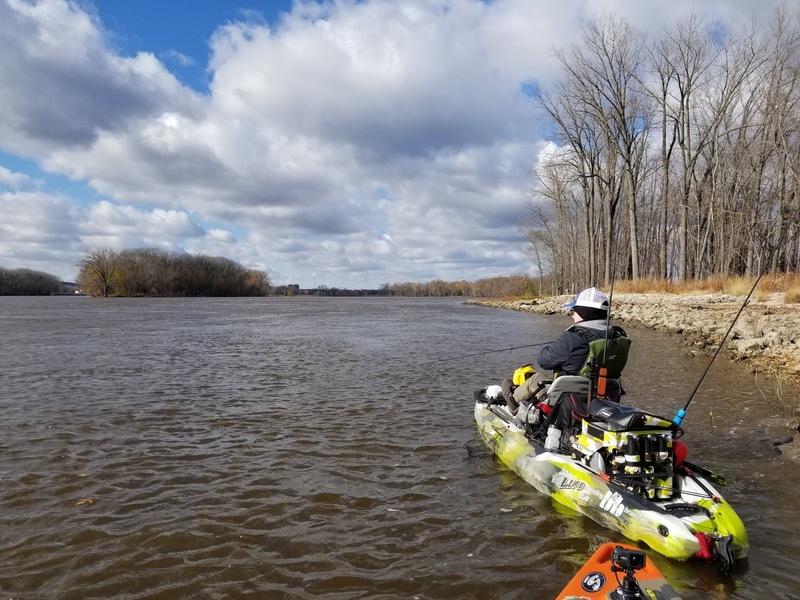 The water temps were dropping, but a few lingering warm days didn't drop it enough to start the fall bite. 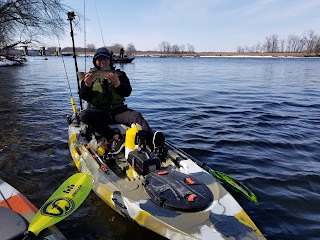 With a poor bite and other obligations that day, my enthusiasm and time on the water ended quickly. But I knew it was still there, my Happy Place. I just had to change things up to find it. Fast forward a week. Temperatures mostly stayed down, confirmed by the heat rising from the river in town every morning. Chang and I opted to visit our main fall spot, and we were glad we did. The bite was good. Still a bit slow, but we were catching quality fish. And they were still fighting hard. I l landed several respectable largemouth bass and Chang caught some pigs, one a shade under 5 lb. But as the afternoon crept up on us, the bite continued to slow. We were both tired. I lost what was likely my personal best bass due to lack of energy to set the hook. We decided to throw in the towel. This was a step in the right direction, but something was still missing for me. That evening, I was chatting with Chang. I had family plans the next day but we decided to sneak out on my home lake for a couple of hours. With the early signs of the fall bite, I was hopeful that trend would continue as the fish fatten up for the bitter cold and ice to come. We made plans to meet at first light the next morning. However, I had to figure out how to get out of the grind or rut of the tough summer bite and go back to what I know and love. That is fall fishing out of a kayak. Simple as that. I looked out my window at my truck loaded with my Feelfree Lure 13.5. It has everything. Overdrive pedal drive, a tackle bag equipped with 5 rod holders and 7 - 3700 trays, a cooler, two more rod holders, an ultra-comfortable seat, amazing stability, plenty of deck space, my GoPro mount, a solar panel, the list goes on. 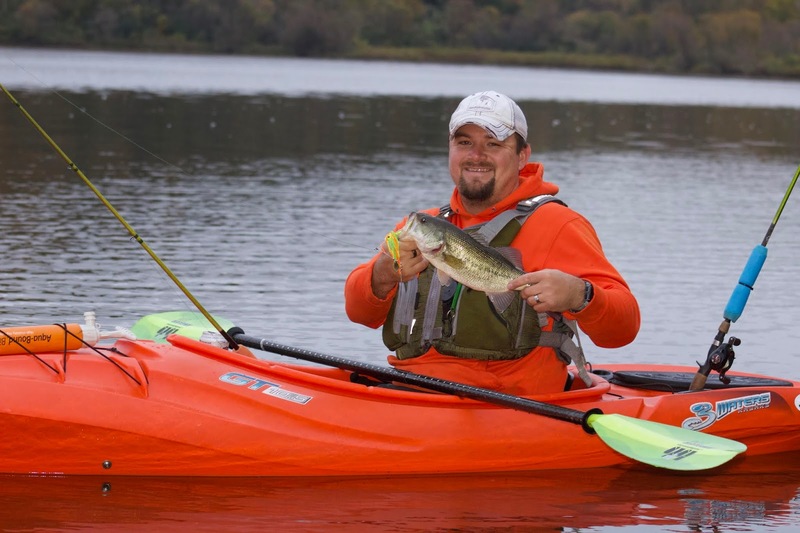 People who fish from a kayak know "The Routine". Everyone has a routine for launching and loading. Untying/unloading the kayak, getting the rods out and in their spots in the wide selection of rod holders, putting in the fish finder and/or pedal drive, putting the refreshments in the cooler, spare gear in the hatch, tackle in the storage spots, safety gear within reach, keys/wallet/phone in safe spots, PFD on your back, launch, fish, return, and repeat in reverse. It can be quite the process that in my state of exhaustion sounded.....exhausting. Don't get me wrong, I absolutely love my bigger kayaks and would never downsize. However, at that moment, I decided I needed to simplify, exponentially, and come up with a "throw and go" configuration for the next day. 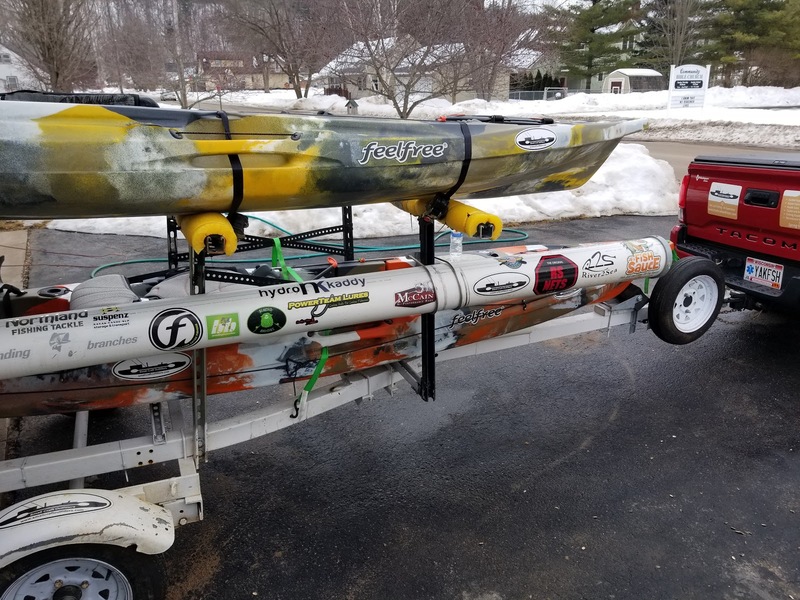 Enter my newest boat, the 3 Waters GT 105 kayak. Light, fast, surprisingly stable, a sit-in, and MSRP of a meager $399. I had installed rod holders in it for such an occasion. So I went outside, drained/sponged the rain water out, and threw in a few things. My Bending Branches Angler Pro paddle (costs almost as much as the kayak - but worth every penny), a box of Northland Tackle spinner baits, my wading tackle bag with pliers and JBs Fish Sauce scents, my safety gear, and my PFD. It all fit in the hatch and cockpit of the kayak. Satisfied with my decision, I set my alarm and go to bed. I wake up 45 minutes past my intended launch time. I had shut off my alarm in my sleep. Jumping out of bed, I grab the cold weather layers I had laid out the night before and head out the door. Normally I will have pre-loaded all of my gear in my truck to save time in the morning. No need, I grab the GT with all of my gear in it, slide it in the truck, and throw one strap around it. This succinct ritual is repeated at the launch. Remove one strap, slide it out, park, and go. A smile hit my face. No worrying about forgetting anything, no heavy gear, just the basics. And it felt great. It was a picturesque fall morning. Some wish for 75 degrees and bright blue skies for kayaking. I wish for a day like this. Air temps in the 40s, water temps unknown but well under the point where topwater works (electronics stayed home), overcast skies, and sky warned us of upcoming rain by teasing us with a light drizzle. I knew the fish would be biting and Chang and I would have the lake to ourselves. Only we are crazy enough to fish this lake in these conditions in a reservoir down 3 feet for maintenance. But it paid off. I am used to the large, ultra-stable, ultra-comfortable Feelfree Lure lines. That comfort and stability comes at a price, speed. So taking off from the launch with the 3 Waters GT feels like a human propelled plastic rocket. I was across the bay to meet up with Chang in a (relative) blink of an eye. He reports success with decently sized panfish. Due to medical issues last fall, I did not fish. I was determined to get my fall bass bite fix. 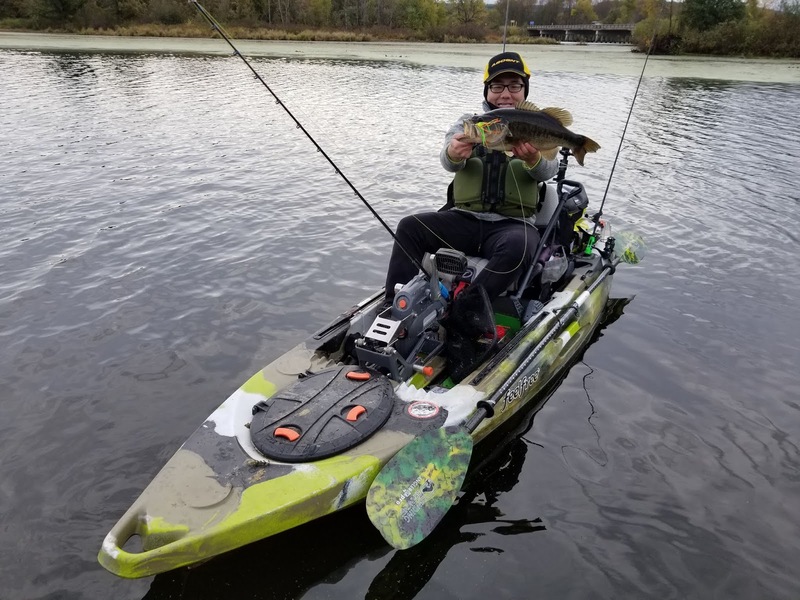 I pull my spinnerbait rod from the custom installed rod holders like it were my Excalibur and start tossing a 1/2 oz Northland Tackle Reed Runner 2 in Firetiger, my year-round go to lure. A few casts later and a fresh application of JBs Fishsauce scent, I get a hit. Based on yesterday's bite, the fall bite is just starting. This means a feeding/fighting frenzy. The bass are biting hard and fighting the same. Once the fall bite is peaked and nearing the end, the bass will be like limp noodles after being hooked. Their instinct before ice is to conserve as much energy as possible before the long winter. This fish is doing the same. No beast, but a respectable fish. 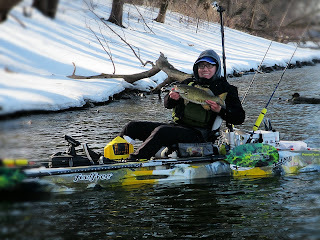 Chang captures a photo of my first fish in the 3 Waters GT and my first fish in a sit-in kayak! Hopeful this quick catch is a sign of things to come, I continue working the bank. The efficient and light design of the GT kayak allows me to use the 1/2 oz dual-blade spinnerbait as a trolling motor. I work the bank in a fan pattern. About 10 yards from shore I cast forward then fan to the right, repeat. This pulls me in a perfect pattern to key ambush spots. This method produces another bass......errrr pike? I am not sure because this fish is taking me for sleigh a ride in this little boat. I'm usually able to tell a pike from a bass, but not in this case. As I get pulled around, the kayak leans hard to my right. Unlike other sit-in kayaks I have used, never did I feel like I would tip. I could land a massive pike in this boat without concern. Pushing the sit-in stereotype aside, I continue to reel and see a large flash of silver next to the boat. Then it was gone in an instant. I didn't have a good hook set on this 4+ lb bass. Normally I'd get upset losing a respectable fish. Instead I have a massive smile on my face and laugh it off and continue down the shore. A short time later, I catch two respectable bass on back-to-back casts. This is my moment, when I re-discovered my Happy Place. I take a moment to enjoy the crisp gentle breeze, the fall colors on the surrounding trees, the local bald eagle and vultures gliding above the water on their morning hunts, and the silence. Pure silence and calm as I float. I felt a renewed appreciation for this fishery and this sport I love. No pressure to catch fish, no pressure to help others catch fish, no additional rods and pounds of tackle to make me consider constantly switching rods. Just my sit-in, safety gear, and spinnerbaits. Life is good. I continue working the stretch of bank in the same manner as before. Though many dinks were caught, I lost count of the number of fish I caught. All within an hour's time. I couldn't have been happier (well, a state record fish may have made me happier - but no complaints). I caught so many fish my spinner bait wire fell apart from repeated bends. Due to limited time, I opt to toss the other rod I brought with a Rapala DT 6 as to not waste time tying on another lure. I work the same shoreline in the same manner as I did before and manage to land several more fish. I meet Chang who was slowly working the shoreline for panfish. He reports continued success with pan fish as I continue working the shoreline to the spot where I missed the 4+ lb. bass. Unfortunately, I was unable to get him to bite again. I take another moment to breathe in the crisp fall air and enjoy the scenery and solitude of the morning. 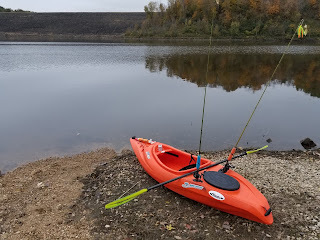 I stash my rods in the rod holders, and paddle on towards Chang to exchange goodbyes while getting in some exercise via a rigorous paddle across the lake and back to the launch. My load-up process is the reverse of my launch and takes a dismal 5 minutes. I take a few extra minutes to reflect on the morning and how successful it was on so many levels. The GT kayak did not disappoint. For a sub-$400 boat it blew me away. It will be stored for the colder weather, but made me appreciate the simplicity it brought me. 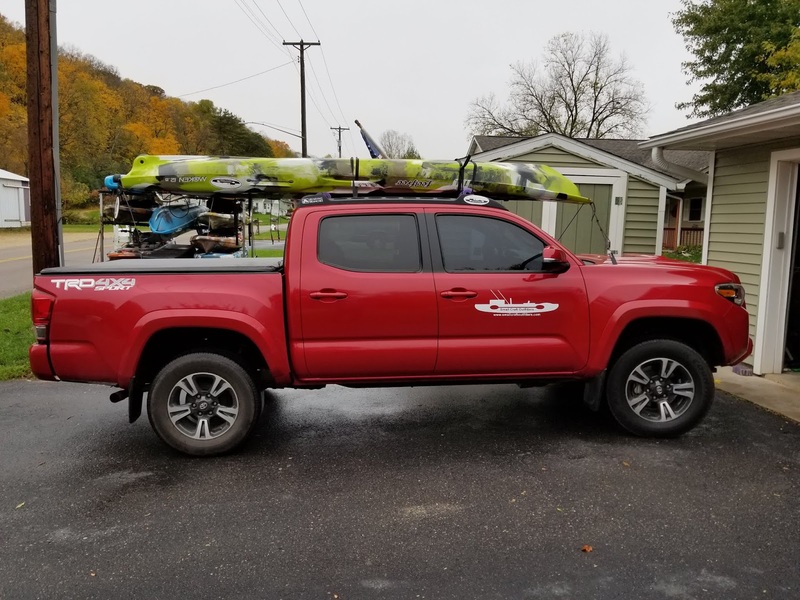 I decided to get a roof rack for my truck on which I can keep my wife's Feelfree Moken 12.5. Also a fast boat, but the sit-in design makes it more cold-water friendly. It will reside on the top of my truck unless I opt to do an all day float with my Feelfree Lure 13.5. This fall, I will continue to find my Happy Place so the thick ice of the winter makes my heart grow even fonder for the sport I love over the bitter Wisconsin winter. I learned this year the importance of re-centering your soul by re-discovering your happy place before it becomes your grind. First of all, I'd like to apologize to my regular readers for the silence. I was going to school to become an EMT while dealing with some family health issues over the fall/winter. I am back, and it feels good to be writing again! My first big outing of 2018 was exactly what I needed to resurrect my writing. 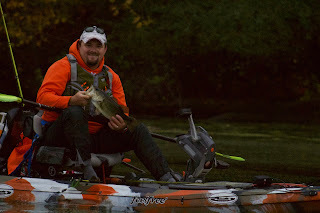 A day kayak fishing with my good friend Chang of www.cxfishing.com! It is March in Wisconsin. Temperatures range from -10 to 45. We can see 50+ degree swings in a day. The robins and geese are returning from the south, bald eagles and ravens enjoying feasts of the roadkill previously frozen under feet of snow. Wisconsinites are out in t-shirts and shorts, anxiously awaiting warm-weather activities. When this happens you'll find a majority of Wisconsinites doing things the rest of the country would deem "crazy". 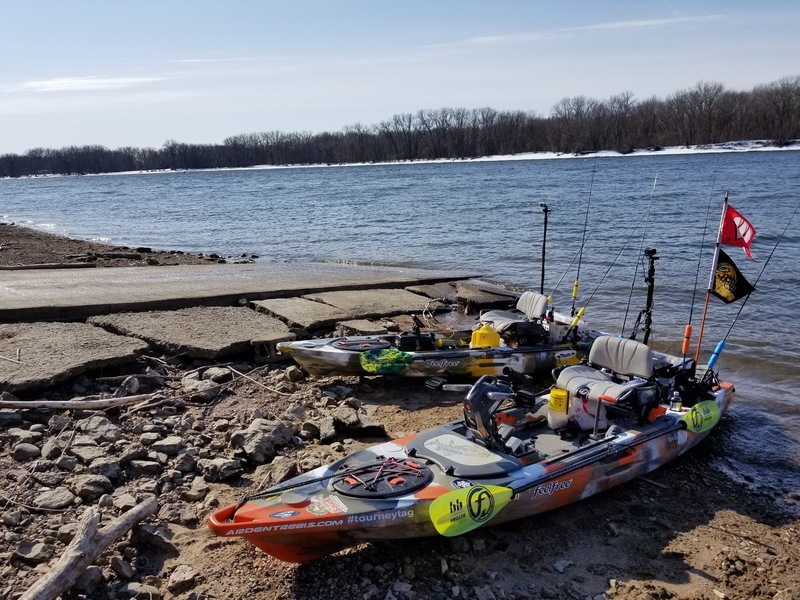 We wear shorts, we grill (though we never actually stop doing that all winter), we take convertibles out (top down), motorcycles will be spotted on the road, we'll still ice fish though it is rapidly melting, and we'll hit any open water we can for some walleye. Chang and I took it to another level. The plans started early in the week when the weather was melting the snow and reports showed temperatures maintaining 40s during the day. We'd launch at Everts Resort in Hager City Wisconsin. We had tested out the FeelFree Overdrive pedal system there in January. Just below the dam between the Mississippi River Pools 3 and 4, they have open water all year. Saturday morning arrives, I am loaded and ready to go. Chang is borrowing a Small Craft Outfitters kayak with a rudder because he is awaiting delivery of his pedal drive and rudder system for his. He does, however, have a brand new Bending Branches Angler Pro in Raptor Green to propel him up the Mississippi. Having just finished the Madison Fishing Expo in Madison, WI I moved mine from my show-friendly-shorter Lure 11.5 to my 13.5 for some extra space. A 45 minute drive put us at Everts around 10 AM. The parking lot was loaded, staff were there shuttling people out to the road for overflow parking with their UTV. The driver pulls up as we are unloading the kayaks and says, "You guys are &*!$ crazy.". He couldn't believe we are planning to go up by the dam with the big boats. But we are used to pushing the limits and prepared for the challenge. This said, DO NOT TRY THIS AT HOME. These conditions were VERY dangerous. Without proper experience and equipment the outcome would have been fatal. A short time later, our kayaks are rigged up and ready to go. 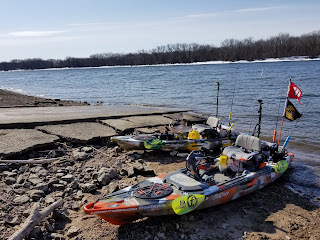 We are impressed with the relatively short rig time as the new equipment tends to throw off our rigging routine the first couple times in the year. Leveraging (pun fully intended) the FeelFree wheel-in-the-keel of our Lures, we maneuver the kayaks near the top of the launch. I manage to maneuver my truck and kayak trailer between others in the parking lot, negating the need for a shuttle. 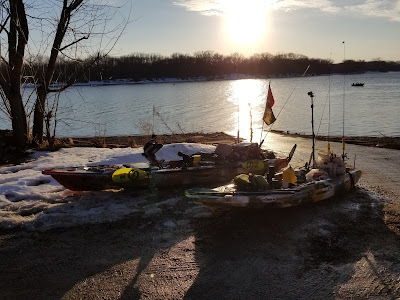 After checking the drain plug for the third time on each kayak in these hypothermic conditions, we launch. Chang is equipped with my Garmin Striker sonar and confirms the water temp at 36 degrees. The wind is blowing HARD upstream at about 10-20 MPH. 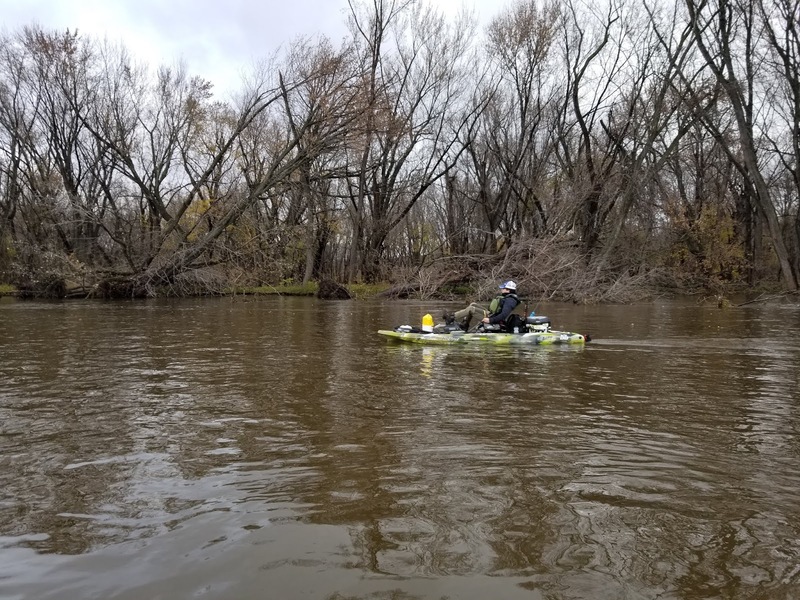 My USGS scouting of the river flow at Red Wing, MN is confirmed. There is nearly no current downstream. Waves are about 1-3' with white caps making paddling dangerous. My longer 13.5 is getting tossed around a bit because it is longer than the gaps in waves and gets twisted between them at times. To add fuel to this watery fire, there are hundreds of boats chasing walleye. They vary from jon boats to $80,000 fully setup brand-new walleye boats. This boat traffic adds to the waves by clashing with them. I feel like I'm riding a mechanical bull. Except there is no pad below me, just 20 feet of certain hypothermia in the form of the Mississippi River. Nonetheless we, continue on. 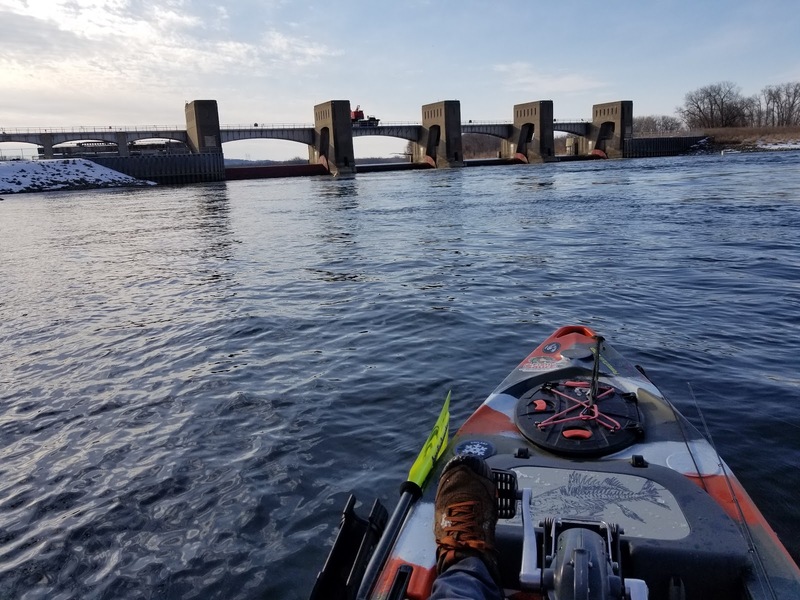 It is approximately a 1.5 mile paddle to the dam. About halfway there, the wind is in our favor. However, the random thrashing waves makes navigation difficult. But eventually, we learn the kayaks blow sideways upstream well in the wind. Not recommended in this heavy chop, but our experience and kayaks can handle it. After some drifting, jigging, dragging without success we can see the dam and 150+ boats in the small area below the dam. We continue to drift upstream and the boat traffic is crazy. I've kayak fished Castle Rock Lake in Central Wisconsin, so I've experienced boat traffic and chop before. But this was a whole new level. Hundreds of boats in a small space, some of which are weaving between other boats at high rates of speed. The wind is whipping up the Mississippi valley off the Wisconsin bluffs and increasing the chop. After approximately a dozen boats went by buzzing us at high speeds, Chang said he was going to head closer to shore. I concurred. It was getting too crazy for comfort. A local Sheriff boat was patrolling the area, but that wouldn't be helpful if a 5,000 pound boat going 40+ MPH t-boned us. 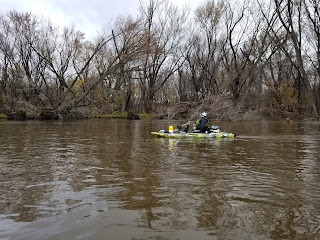 We got closer to shore and continued our float upstream thanks to the wind, and shortly thereafter came upon a slightly calmer section of water. Then a kayaker's dream in a mess of boats. Shallow water! Chang and I use the shallow area as solace from the chaos experienced over the last hour or so. I use this as an opportunity to inhale a sandwich while working the holes in the area. With the rocks and debris in the holes, snags became common. But we'll take snags over the boat chaos. We each missed a few bites. The fish kept robbing my minnows. This being my first real open water fishing trip this year, I left some tackle (stinger hooks included) at home. Oh well, I enjoyed the float, the company, and getting my line wet. In the frigid water, fish were conserving energy, not the topwater blowups or spinnerbait slams Chang and I are accustomed to. Thus, when I glance up to see what Chang is up to I didn't think anything of his rod bending over without the typical flick of a fish on. Until I seen the surface break. Anyone that has fished with Chang and I know we like to hollar when we catch something, it is muscle memory adding to the excitement of the catch. I try to hold back, but the other boats take notice to my excitement and start flocking around us like a group of ravens on fresh roadkill in May. A few moments later, Chang lands a nice eater size walleye! A quick use of the ruler on the shaft of our Bending Branches paddle has it just under 17". The nearest boat looks and asks for details on how Chang caught it, a sign of a slow bite. A short time later Chang manages to land another fish. This time a Smallmouth Bass measuring 18". It is a beautiful light brown in the post-winter water with the tiger stripes radiating from its head. A beautiful fish, a female loaded with eggs. 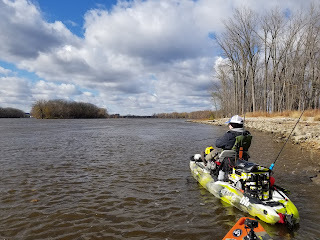 We end up working our way through the parking lot of boats to the furthest point we can fish by the dam (DNR has a sign up about 50 yards from the dam that says we can't get closer until May). I temporarily land the kayak for a bio break (urinating in a kayak with multiple layers in hypothermic conditions is exponentially more difficult than it is in the summer). We then decide to make our way back into the strong headwind (though slightly better than the morning) back to the launch. This is when I discover the beauty of the new pedal drive system from Feelfree. I'm able to pedal into the current more efficiently than paddle. A not-so-short time later we are entering the dock area of Everts Resort. We have grown accustomed to hundreds of looks and photos from boaters thinking we were nuts. A group of walleye fisherman in a beautiful walleye boat idle near us and ask how we did. We tell them it was slow, but we caught a couple. They asked, "Was it a little rough out there for ya today?". I smile and say, "Oh yeah". But we made it, we had fun, and will live to fish another day.... We'll be back, next time in safer conditions and more fish. Even so, I wouldn't trade my kayak for the most expensive of fishing boats. I've never been so at peace or caught bigger fish in my life.